Blog: The Margarine Vs Butter – Which is Better? Which spread is better, margarine of butter? This question is frequently asked by many, yet confusion still remains. In order to understand the margarine and butter debate, we need to ask and answer a few questions surround the use of these products. Butter is a hard animal fat, made from dairy cream, it naturally has a high percentage of saturated fat. Saturated fat is a hard and inflexible fat. Margarine is manufactured from plant oils (mostly what we refer to as unsaturated fats (mono-unsaturated and poly-unsaturated fat) Unsaturated fats are characteristically flexible and fluid in nature. Through a process of hydrogenation, hydrogen is added to the long chain unsaturated fats found in plant oils, reducing the number of double bonds in the long chain fatty acid and therefore making the plant oils more saturated than they usually are in their natural state. The harder the margarine the more hydrogenated the oil and the greater the percentage of saturated fat (trans fatty acids) in that particular margarine. Trans fatty acids are hard fats, but have a slightly different structure to naturally occurring saturated fats found in butter and have been found from research to be highly detrimental to health even more so than the types of saturated fat acids found in butter. So hard margarines are not a healthy choice. In contrast soft sub margarine, which have less hydrogenated fat than hard margarines have less trans and saturated fat and because of this are often considered to be a healthier choice. Saturated fat and trans fats are associated with an increased risk from chronic diseases such as coronary heart disease, obesity, diabetes and even cancer. 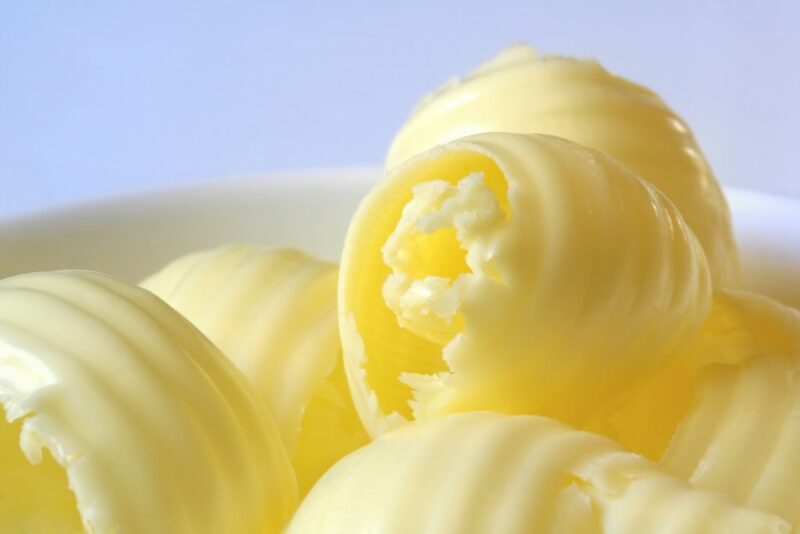 Although in recent years even the different types of saturated fat seem to confer different risks and stearic acid in butter is now considered to be almost neutral as far heart disease risk is concerned. Nonetheless, butter has a high percentage of saturated fat in it, and saturated fat is still a concern as far as cancer risk is concerned and when it comes to promoting overall health and a healthy weight. There are a variety of margarine’s on the markets, light spread, Canola, olive oil, which one should you choose? Most saturated fats and all trans fats are a real no no when trying to pursue health and prevent chronic disease. So what about soft tub margarines? Soft margarines are most often made from “vegetable oil” such as safflower oil, soybean oil, canola oil or sometimes a blend of oils including olive oil. Many of the oils used to make margarines (excluding olive and canola oil) contain polyunsaturated fats called omega-6 fatty acids. This is considered to be an essential fatty acid that the body cannot make itself and needs to be obtained from dietary sources. Another essential fatty acid that is perhaps more important is omega-3 fatty acids, this is usually found in wild caught salmon, fish oil and flax seed, and in limited amounts in canola oil. In the modern day diet we tend to find that the food we consume has an unbalanced ratio of omeg-6 and omega-3 fatty acids. It is estimated that the essential fatty acids ratio in the modern diet of omega 6:3 is approximately 16:1, while it should be 3:1. By including soft tub margarines made from polyunsaturated fats (non-specific “vegetable oils”), you will automatically continues to include more omega-6 than omega 3 into your diet. A disturbed ratio of omega 3 and 6 has been associated with inflammation and insulin resistance, which in turn is also associated with chronic diseases such as diabetes and coronary heart disease. So too much omega-6 fatty acids in the diet is not good either. Therefore consuming tub margarines that are manufactured primarily from oils that are rich sources of omega-6 fatty acids such non-specific “vegetable oils” is also undesirable. This leaves you with the option to use an Olive oil or a Canola oil margarine. Providing these are soft tub margarines, these types of margarine are often a blend of oils, but at least contain more monounsaturated fat and possibly less omega-6 fatty acids. The monounsaturated fats (Canola and Olive oil) have also been found to be associated with improved health and a reduction in chronic disease risk as shown from studies that have looked at the health benefits of the Mediterranean-Style diet. Therefore the best choice as far as butter and margarine is concerned is to choose a soft tub margarine made form canola or olive oil or a blend that includes these oils. But remember keep portions small in order to control total daily fat and Calories intake. There are other options to using margarine and butter as spreads and certainly for cooking. Here are some ideas. If you need to cook with fat give preference to olive or canola oil. To add extra flavor use infused oils, for example olive oil infused with Rosemary or garlic. Alternative spreads include, avocado mashed with a little lemon and black pepper, smooth low fat cottage (used plain or with chopped chives for extra flavor). Peanut butter is also a suitable spread and rich in mono-unsaturated fats. Other nut butters such as almond butter and cashew nut butter add variety as suitable spreads. Humus can be used on sandwiches as a tasty alternative to conventional spreads. Olive paste, sundried tomato paste or even basil pesto are tasty spreads that add variety, flavor without the complications saturated fat, trans fat and omega 6 fatty acids.